We are Weymouth and Love Weymouth have teamed up to support the Dorset Echo Dine For Less 2019 Promotion and we’re delighted to tempt you with a fantastic range of food and drinks deals and exclusive discounts at Weymouth dining and drinks venues from January 20 to April 5 2019. DINE FOR LESS SPRING DEALS AVAILABLE NOW AT THE GALLEY BISTRO: – The Galley Bistro is situated in pretty Hope Square just a few minutes’ short walk from the picturesque harbour in the heart of historic Weymouth. Deal:- FREE STARTER OR DESSERT when ordering a main course from the main menu. DINE FOR LESS SPRING DEALS AVAILABLE NOW AT BENNETT’S FISH AND CHIPS: – 25% OFF total food bill any day of the week OR 2for1 on main courses ordered from the main menu. DINE FOR LESS SPRING DEALS AVAILABLE NOW AT THE SECRET GARDEN: –The Secret Garden is an exciting new Vegan, Vegetarian and Gluten-Free café in Hope Square, Weymouth. 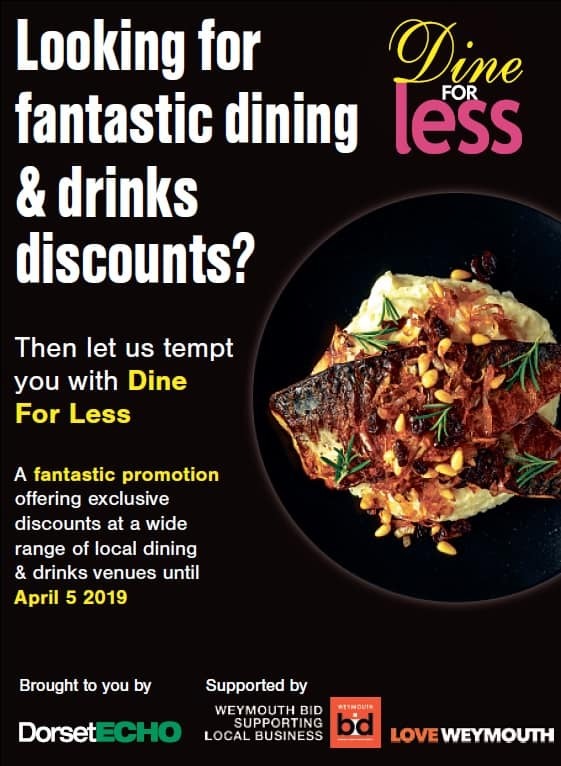 DINE FOR LESS SPRING DEALS AVAILABLE NOW AT THE SLUG AND LETTUCE: – Whether you are looking to meet up with friends, share a drink with your work colleagues or ‘go solo’ and catch up with the papers over coffee. We look forward to meeting you at our brand new Slug & Lettuce. DINE FOR LESS SPRING DEALS AVAILABLE NOW AT THE TUGA BAR: – Restaurant TUGA offers a varied selection of the finest Portuguese dishes combining fresh, simple ingredients with a genuine love for Portuguese cuisine. DINE FOR LESS SPRING DEALS AVAILABLE NOW AT THE CROWS NEST IN THE SQUARE: – The Crow’s Nest is a hidden gem in Weymouth’s beautiful and historical Hope Square. DINE FOR LESS SPRING DEALS AVAILABLE NOW AT THE NOTHE TAVERN: – Nestled in the Nothe Gardens, serving up freshly cooked dishes using seasonal ingredients cooked with flair under the guidance of multi award winning chef Chris Wheeler. DINE FOR LESS SPRING DEALS AVAILABLE NOW AT NICETTA: – Nicetta, in the heart of Weymouth Town Centre, specialises in delicious authentic sourdough pizza, fresh pasta dishes and incredibly tempting cakes and pastries along with a great range of coffee’s etc. DINE FOR LESS SPRING DEALS AT LES ENFANTS TERRIBLES AVAILABLE NOW: – Harbourside restaurant with an ethos to serve locally caught fish and locally made produce to customers who are looking for somewhere where they can relax and unwind with good food and great ambience. DINE FOR LESS SPRING DEALS AVAILABLE NOW AT THE KINGS ARMS: – On the historical South harbour side serving hand crafted British pub classics, roaring log fire and traditional real ales on tap. DINE FOR LESS SPRING DEALS AVAILABLE NOW AT THE REX HOTEL & RESTAURANT: – Located in the vaulted wine cellars of the original Georgian building, The Rex Restaurant at the Hotel Rex has an excellent reputation for quality, value and hospitality. Deal:- 25% OFF the total food bill when ordering from the main menu.